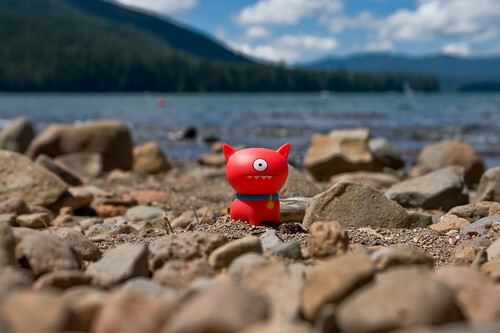 Uglyworld #709 - Rolf at Elk Lake, originally uploaded by www.bazpics.com. After recovering from his mile long run in search of some snow earlier in the day Rolf was more than happy to take a little stroll around the stone covered beach at Elk Lake. I threw a stick for him a few times, but he didn't seem too bothered after a couple of games of fetch - I think he's missing big Wage who's back home in Aachen looking after the house and cooking tasty grub for the other guys.